Liverpool lost their unbeaten record in this season’s Premier League at the 21st hurdle as rivals Manchester City reduced their lead at the top to four points. 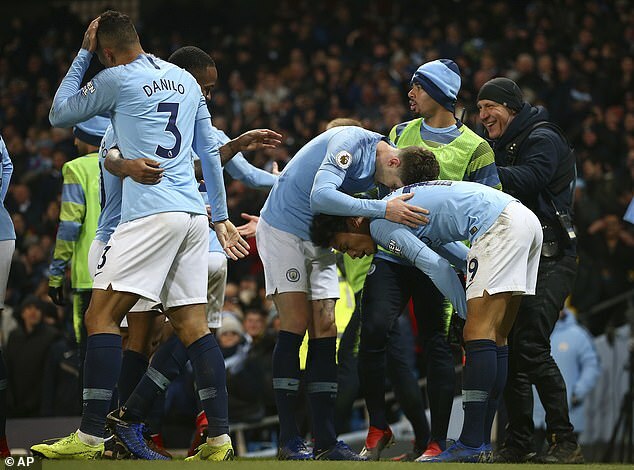 Sergio Aguero and Leroy Sane struck either side of a Roberto Firmino goal as City made a big statement with a 2-1 win at the Etihad Stadium on Thursday night. The game produced more talking points than those three goals though and Sportmail has rounded up six things you may has missed below. Liverpool manager Jurgen Klopp was a keen observer as City’s players warmed up on the pitch about an hour before kick-off. The German gaffer, wearing a club tracksuit and baseball cap, stood by the halfway line with his hands in his pockets and watched on as the home side were put through various stretching exercises. 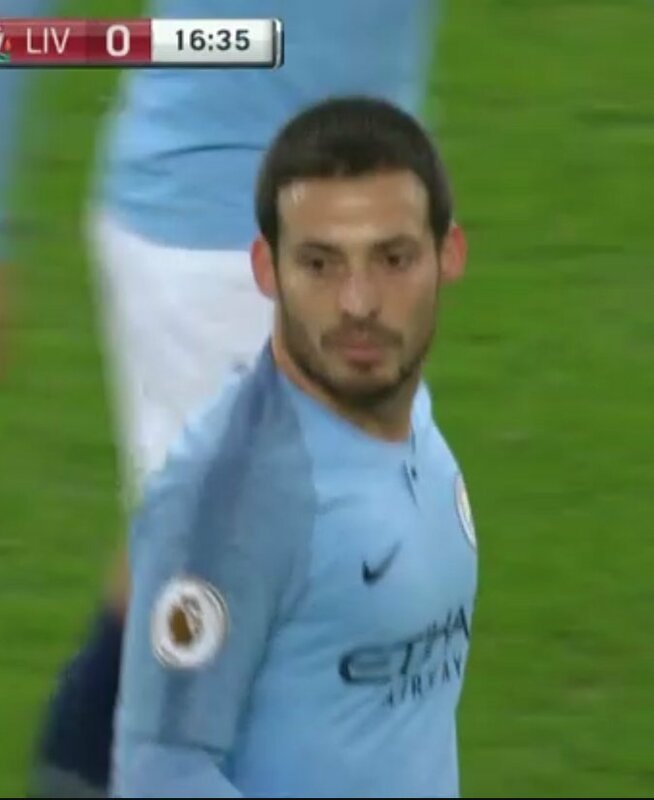 David Silva did not have as much of an impact on the game as he would have liked. The City playmaker was hooked on 65 minutes after failing to complete a third of his attempted passes. But that’s not what caught the attention of fans on social media, with many instead quick to comment on how much newfound hair the Spaniard had on his head. 3. That’s not very nice! 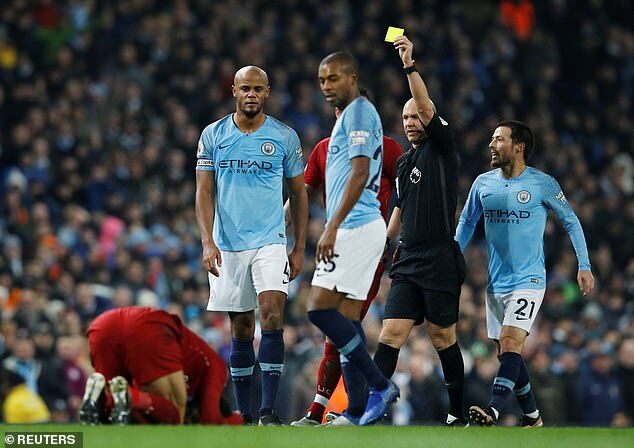 City captain Vincent Kompany was perhaps lucky to stay on the pitch after his ugly tackle which crudely stopped Mo Salah running though on goal in the first half. 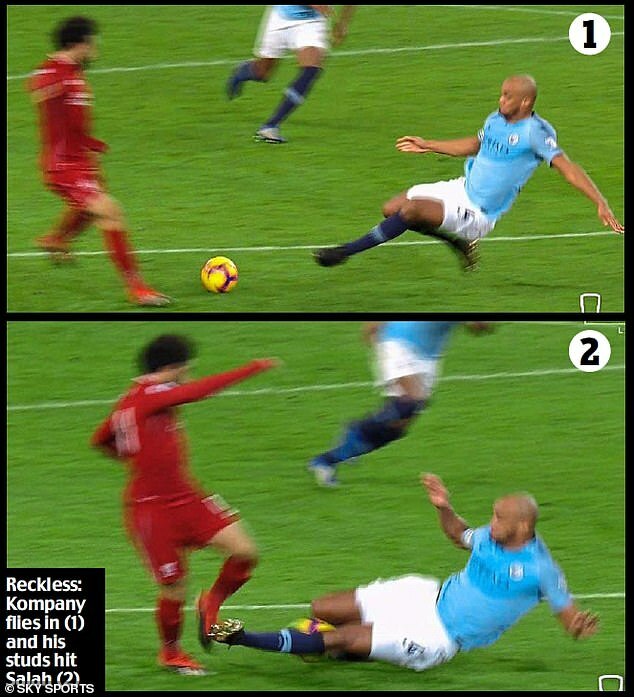 What Kompany is alleged to have said to Salah after kicking him was even cruder. Twitter user Elliot Hackney shared a short clip which seemed to show Kompany calling Salah a p**** while the Liverpool ace lay on the floor. Injured left back Benjamin Mendy likened John Stones to cartoon character Inspector Gadget after the City defender produced a dramatic goal-line clearance. After Liverpool forward Sadio Mane had struck the post at 0-0, Stones attempted to hack the loose ball clear but kicked it against goalkeeper Ederson which very nearly resulted in an own goal. But Stones stretched back incredibly to clear ball properly when it was all but 11mm over the line. To make things even more remarkable, Stones managed to thread his clearance through the legs of Salah, who was trying to bundle home from close range. On Twitter, Mendy wrote: ‘That gogogadgeto save from Stonesey is absolutely incredible’. 5. Simulation… by the referee?! Referee Anthony Taylor had a fairly busy evening as he booked six players. 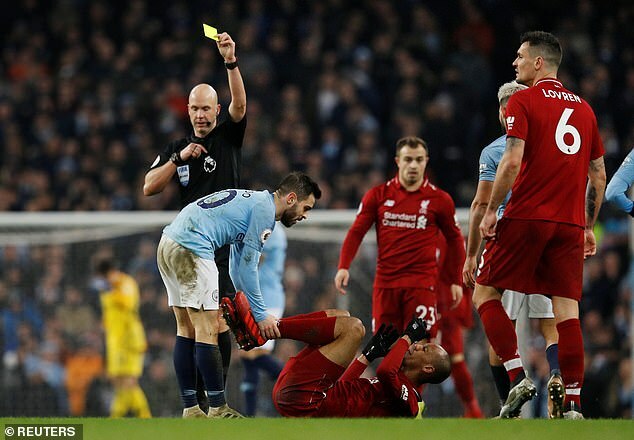 But fans on Twitter joked that he should have shown himself a yellow card for diving after the man in black took a tumble inside the Liverpool penalty area during the 50th minute. There was clearly no contact. Was this simulation? Jurgen Klopp pulled out a bottle of water from his pocket and shook it in celebration after Liverpool scored their equaliser. City boss Pep Guardiola also used a prop while showing emotion as he furiously yanked off his scarf and threw it to the ground in the closing minutes. Guardiola’s fury appeared to be sparked by his belief that City should have been awarded a free-kick in the build-up to a chance which saw Salah go close to making it 2-2.